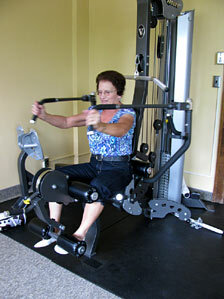 We offer you several types of exercise here at The Center. Bone Builders Chair Exercise is a safe, low impact exercise program. It relies on weight training to protect against fractures caused by osteoporosis by increasing muscular strength and bone density. Classes are held Monday, Wednesday and Fridays at 11 am and are done at 11:30 am. Each person completes the exercises at their own capabilities. Chair Yoga will be meeting at 4:30 pm on Tuesdays in the Great Room on first floor. Trish Keating is the instructor. Chair yoga has simple movements designed to lubricate the joints, stretch the muscles, and strengthen the core for improved balance. Why not give it a try! Exercise Rooms Access is included in your membership. You could begin your exercise routine as early as 7 am Monday thru Friday. The exercise rooms are located on fourth floor of The Center. The equipment we have available for your use includes: treadmills, recumbent bike, row machine, elliptical, exercise bike, exercise balls, bosu ball, weight bench, stretch machines and a Hoist workout machine. You only need your membership and a little motivation! Zumba Gold: Are you ready to party yourself into shape? That’s exactly what Zumba Gold is! Join us on Tuesday, Thursday and Friday mornings at 9 am for this fun exercise program. You will be learning Latin dance steps to jazzy music! You’ll have so much fun you won’t even know you’re exercising! This is an awesome program, just ask those who participate. The Center Energized: We walk Monday through Friday, starting at 10 am. We meet in the front lobby and walk around the neighborhood to Gregory Park and around the north side. When it is really cold, we walk to the Franklin Art Center, which is only two blocks from The Center. We go inside, take off our coats, and walk the hallways! Of course, then we have to get our coats back on and walk back to The Center. It is always a fun time! Pickleball is played every Tuesday at 9 am at the Gregory Park Tennis Courts from May through October. Tennis starts at 9 am every Wednesday at Gregory Park Tennis Courts from May through October. Show up at Gregory Park for either of these activities. You will need your current membership card from The Center along with $20.00 cash and/or check made out to Brainerd Parks and Recreation Department. The playing season will be from May 7th through October 31st. Please contact Jeanne and/or Bob Larson @ 218-838-2552 or 218-838-4685. They are the Pickleball and Tennis Coordinators. Check your newsletter for more information. Golf coordinator is Bruce Lapka. You could call him @ 218-330-1124 with questions. Golf will begin on Monday, June 3rd at 9 am at Craguns’s Legacy Golf Course. They will play every Monday through August 26th. The Center members will receive a special rate of $7.50 per person or $12.50 with a cart. Check your newsletter for more information. Let’s Go Fishing: There will be a LGF pontoon available for trips from June through August. Check your newsletter for specific dates. You will be supplied with a fishing rod, bait and life jacket to use for the afternoon. Make sure you have a fishing license. It is a ton of fun and you have the opportunity to catch supper. Snowshoes are available for check-out during the snow season. Sign out one of our 20 pairs of snowshoes and enjoy the beauty of our Minnesota winters as you exercise outdoors. The Northland Arboretum has groomed trails for snowshoers.